Have you been nervous to try Acupuncture? Watch Dr. Burrup give an acupuncture treatment in his office by viewing the video below. The needles used in acupuncture are very small compared to needles used for getting shots or drawing blood. Six to ten acupuncture needles will fit inside a standard hypodermic needle used for drawing blood. They are very thin and, depending on the style of acupuncture used, can be inserted a couple of millimeters or a full inch into the acupoint. Many people do not feel the needles when they are inserted. Those that do feel any discomfort equate it with that of a small pinch. Dr. Trent Burrup is a certified acupuncturist through the International Academy of Medical Acupuncture. He has had tremendous success helping people with a variety of health concerns, many of which have not responded well to traditional Western medicine. Hundreds of clinical studies on the benefits of acupuncture show that it successfully treats conditions ranging from musculoskeletal problems (back pain, neck pain, and others) to nausea, migraine headache, anxiety, depression, insomnia, and infertility. Dr. Burrup treats all these conditions and many others with acupuncture, as well as chiropractic and other holistic therapies. 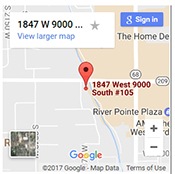 The Institute of Chiropractic and Acupuncture Therapy provides chiropractic, acupuncture, and wellness therapies to patients in the Salt Lake metro area, Utah County, and from as far north as Logan. We even have patients from out of state. Come experience the difference at The Institute…Become Empowered With Your Health! Chiropractic: What Can It Do For Me? Please enjoy this video on how Chiropractic can help you and how chiropractic adjustments actually assist the body to heal itself. Dr. Trent Burrup is a chiropractor that provides outstanding chiropractic and wellness care in the Salt Lake Metro area including West Jordan, South Jordan, Riverton, Herriman, Taylorsville, Murray Bluffdale, Sandy, and other cities in the metro area. We have chiropractic patients that come from as far north as Logan, from Utah County, and even some from out of state. Come experience the difference at the Institute of Chiropractic! Category: Chiropractor, Natural and Holistic Health Care, Therapies | Comments Off on Chiropractic: What Can It Do For Me?